For anyone who has loved books since first learning to read, the possibility of being surrounded by thousands of them and talking with other people who love them -- every day -- might seem like a dream come true. Decorah native Kate Rattenborg is someone like that; and she's making her dream come true this week, when she opens a new bookstore in downtown Decorah called Dragonfly Books. Rattenborg, whose father, Dave Nelson, served as Decorah mayor for 10 years or so, has a background steeped in books and language -- including a B.A. in English from Luther College (with a concentration in theatre) and a master's degree in library science from the University of Iowa. Rattenborg and her daughters, Rachel, 18, and Sarah, 20, returned to the area about six years ago. They'd been living in Iowa City and the St. Paul, Minn. suburbs, where Rattenborg worked as a librarian at both the University of Iowa and the University of Minnesota; but a tragedy changed everything. In 2002, while on a family bicycle trip, Rattenborg's husband, Steve, died suddenly of a massive heart attack. He was 46. "Shortly after that," Rattenborg says, "I made the decision to move my daughters back and to finish raising them in a smaller community." Having taken several business courses during and after college, and having worked for the past several years in finance as an independent contractor with Thrivent Financial for Lutherans, Rattenborg decided last July that she wanted to explore a new business venture -- by opening her own book store. The name, "Dragonfly Books" is a nod to the memory of Rattenborg's book-loving late husband -- and to the life-lessons she has learned, in the face of profound loss. Describing one of those lovely sorts of moments with which life occasionally presents us, Rattenborg tells a story about how she finally decided on the name for her bookstore. She was driving around and thinking about potential names, when she found herself driving through a swarm of dragonflies. "I thought, 'that's interesting,'" she recalls, and kept driving. "Then I drove through a second swarm of dragonflies." She started doing a little research into the symbolism of the wind-borne creatures; and found that although different cultures approach the symbolism in different ways, the main associations are with renewal and change, light and rebirth, and the power of life in general. "Life is short, and you don't know what is going to happen," Rattenborg says. "Instead of postponing a dream, just embrace it -- and go with it." 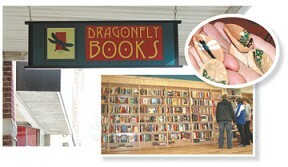 The store's Web site is www.dragonflybooks.com. Phone number is (563) 382-4275. Store hours are 10 a.m. - 5:30 p.m. Mondays, Tuesdays, Wednesdays and Fridays; 10 a.m. - 8 p.m. Thursdays; and 10 a.m. until 5 p.m. Saturdays. For complete story and more photos, pick up a copy of Decorah Newspapers; or, for just 34 cents per issue, subscribe by calling (563) 382-4221. I have visited Dragonfly Books often when my husband and I visit Decorah & Vesterheim (as often as possible) from our Ames IA home. Visiting last year with Kate, she shared with me the story of how Dragonfly Books came to be, as well as the name's origin. Wonderful website. Great book store! <3 > This comment has been hidden due to low approval. Congratulations Kathryn, and best wishes for a great Grand Opening. 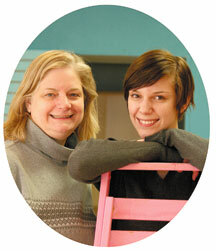 We'll be in Decorah this Oct. and look forward to seeing Decorah's newest business. Uncle Bob and Aunt Jeanne This comment has been hidden due to low approval.